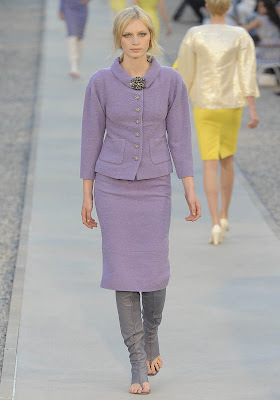 If you have fifteen minutes, check out the Chanel Cruise 2011/12 collection, filmed at the Hôtel du Cap-Eden-Roc in Antibes, France. I was inclined to watch the whole thing because 1) it was night, I was tired, and needed a little hit of fashion to get through the putting-children-to-bed routine, and 2) I fell in love with the jacket above, on the model who opened the show. Watching the girls walk down a runway in front of a 5-star luxury hotel framed by the sea didn't hurt either. Coco would approve! I love the color and collar of this jacket. I also love the brooch. If I'm wearing a suit cut this low, I will take the cover-up that goes with it. Is it just me or does this model look a little like Lindsay Lohan? Yes please, to the jacket! The first and the last jacket are TDF! I agree, this collection sparkles with loveliness. Where are my pretty pennies! Fantastic Jill, thank you for sharing beauty. 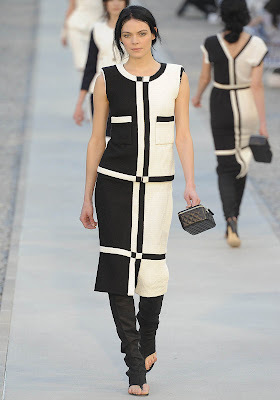 Hi Catherine, when you next come to NYC let's go to a Chanel boutique and try on jackets! Hi Pam, I can totally see you in the yellow jacket, you have such a sunny disposition, it would look divine on you. Hi Sacramento, are you still in Berlin? I hope you are enjoying your trip. I also hope you post about more treasures found at the flea markets there. Am goingto dream about that first suit...it is unbelievable..... thanks! Hi Paula, that first suit was gorgeous, wasn't it, I love that shade of yellow and I don't normally go in for that color. There were two other suits made out of that same tweed so if you go to the Chanel site and watch the video you can see them all in the first minute of the show. I want that jacket too! I like the purple suit second down too. Hi Veshoevius, isn't it funny, I love black so much but that yellow jacket came down the runway and I fell in love with it, and I am normally not a lover of yellow in clothes.